Upon its release in 2011, Michael Dowse's Goon was hailed by many as the second coming of Slap Shot, a hockey comedy that wasn't afraid to first embrace the sport's violent tendencies and take them to humorous new heights. Of course, those same viewers would rather not talk about Slap Shot 2 or 3 (yes, they exist). So, in looking to avoid the fate that has befallen so many sequels, newly minted director Jay Baruchel and company took their time creating a follow-up in Goon: Last of the Enforcers. 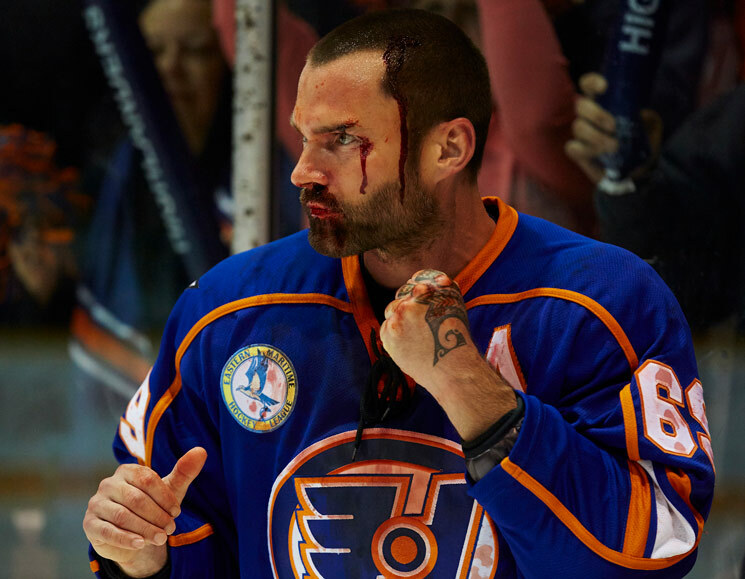 The film opens with Halifax Highlanders enforcer Doug Glatt (Seann William Scott) wilfully pounding opposing players to pulp on the ice, though he soon winds up losing a bout to hotheaded opponent Anders Cain (Wyatt Russell). Considering his latest on-ice antics and his wife Eva's (Alison Pill) pregnancy, Doug decides to hang up his skates and walk away from a sport and group of teammates he loves. Looking for a career after hockey, Doug lands himself an insurance sales job, which he insists is rewarding to keep Eva happy. But when his nemesis Cain accepts a trade to the Highlanders and becomes captain of the team Doug once led, he looks to make a return to the league. Doug trains his fists of fury under old adversary Ross Rhea (Liev Schreiber) in the hopes of guiding the Highlanders to playoff glory once more. Can Last of the Enforcers skate with its predecessor? It certainly outhits it: Baruchel's fighting action comes across cleaner in its camerawork than the shakier scenes of the first film, not to mention bloodier. The film's over-the-top fisticuffs come to a head with one final bloodbath that director Baruchel calls his "pride and joy." Ross and Doug humorously find each other again through a standalone league of enforcers, in which combatants simply skate to centre ice to punch each other out in hopes of being the last one standing. It's a scene in which you should keep your eyes open for some cameos from recognizable NHL enforcers. Off the ice, the film shoots for a subplot that mines the relationship between hockey players and hockey parents, here between Cain and his father Hyrum (Callum Keith Rennie), who serves as the Highlanders' owner. Russell's portrayal of the truly unlikable Cain's in both his personal and professional relationships is commendable, while Rennie remains stern in the "tough love" and masculine tropes that come with the sport. Humorous breaks in the more serious narrative come in the form of SportsCentre updates with TSN anchor James Duthie and Chad Bailey (T.J. Miller), who channel their best Jay and Dan. The crude locker room talk between Doug's Highlanders teammates is minimal but raunchy. Baruchel appears sparingly as Doug's best friend Pat in comparison to the first film, while Elisha Cuthbert makes sure she's heard loud and clear in a crass role of her own.